We understand that although we live and breathe audio visual systems in a wide variety of commercial, government and education based environments – often our customers do not! We have developed this section of our website in an effort to try and assist you with the many and varied frequently asked questions or topics that we find are most difficult for our customers to understand or grasp. If you have a suggestion for a topic you think we should address, please do not hesitate to email us at: info@dibaustralia.com.au and make your suggestion. My projector settings keep getting changed! What can I do? Do you ever walk into a classroom or boardroom to take a lesson or make a presentation and it’s obvious your projector settings have been tampered with? What can be done to stop these types of people tampering with the technology? This annoying issue can be fixed by adding in a control Panel for simple, easy-to-use functionality. This does away for the need for remotes, which can get lost, stops changing of menu settings or one of the most frustrating things about remotes; flat batteries. Many organisations when considering an AV installation opt for one of the following control panels; a JED, Joey or a slightly more aesthetically-pleasing Extron controller with soft buttons. These control panels create a simple interface that any user can operate and prevents the tampering of settings via a remote. How can I stop cables being damaged from the floor box? There has been many issues caused by Floor Boxes that are installed as part of an AV system. The main issue is due to the metal lid closing on the metal surround, which effectively working as a guillotine, cuts or severs cables. This not only means replacing cable, but also creating a potential OH&S issue with “live cables”. Other issues are the lid closing on fingers which can cause injury to varying degrees. The solution is a Protector Series of Floor Boxes from ECD, which have a cleverly designed CableshieldTM Cable Protection Insert. This prevents cables for getting damaged or the box itself becoming “electrified” because of contact with an exposed wire. This is due to the plastic material in the moulding. 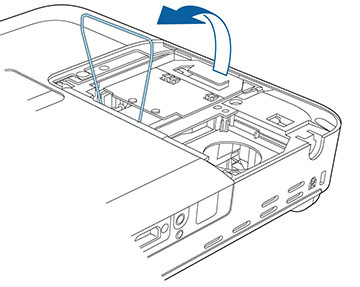 Also unique is the self-close lid, which stops the lid of the floor box closing rapidly on top of cables or fingers. When connecting to an AV system, typically there are two methods. The first is VGA, which has been commonly used for computer/laptop connections for a long time. This is an analogue-type connection and requires the addition of a 3.5mm audio connection to reproduce the sound from a device. So, the (generally) blue connector gives you the visual, whilst the 3.5mm jack provides the audio. VGA was the main connection for many years, but now a digital version called HDMI is becoming the standard for connection to projectors and monitors. HDMI is a more reliable, higher resolution (up to 1920×1080) connection. It also includes the Audio component in the cable, so there is no need to connect a second cable (like the 3.5mm cable with VGA). So, if you have the choice, always go for the HDMI connection for reliability and a higher screen resolution (clearer / sharper images). Then, more recently, projectors and LCD TVs started to come with interactive capabilities. This is where the USB connectivity comes in. 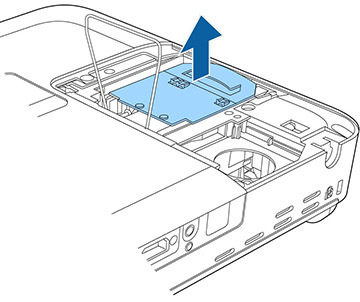 If you don’t have USB connected to both laptop & projector, there the interactive component of the projector will not work. Please watch the video below for a quick overview of these connections. How can I log a Service Job? Please watch the short Video below to understand how to quickly and easily log a service job with DIB Audio Visual. What is EDID and how does it affect my display? In this short video, Sam will explain what EDID is and how this affects the resolution settings between your laptop / portable device and your display (TV or projector). HDMI stands for High Definition Mulitmedia Interface. It is a method for transmitting audio and video data in a single cable. This makes it much easier to connect devices. HDMI is the digital version of the older analogue VGA + 3.5mm audio connection. HDMI has become the standard connection from portable devices to projectors or TVs. In the classroom, this is means a simplified, more reliable way of connecting your laptop or device than VGA. Planning audio visual for a NEW building? Great news; your school or organisation has a NEW building project approved! You’re excited about the possibilities and benefits this new area will create for your organisation. In this Hints & Tips section, we will explore some aspects that will help smooth the process of the AV installations in your new building. As with any AV installations, the first step is to determine what exactly is needed in each space. This is no different with new buildings, except that there are several other parties involved in the process, including architects, builders and numerous other trade professionals. A critical element to the success of any AV system in a NEW building project is the involvement of an AV integrator in the early planning phase of the project. Whilst many architects do an excellent job of designing beautiful and impressive modern buildings, these designs do not always lend themselves to creating workable, functional spaces for the installation of AV requirements. This is where an experienced AV consultant can assist in the design process and help create an excellent result. One of the main reasons for having an AV consultant involved early in the planning phase is so that wiring for the AV system can can be installed, before walls are plastered or permanent ceilings completed. This not only avoids lots of headaches for wiring later, but enables the AV design to be practical. This practicality ranges from the functionality of the AV system through to the “serviceability” of the system. Many of these important factors can get overlooked when the design phase does not included consultation with an AV consultant. DIB Solutions Consultants have extensive experience in providing AV solutions with NEW building projects, particularly with planning and working effectively with all parties involved. Does display size really matter? It sure does! Ah, the age-old question in AV; does display size really matter? In our 20 years of experience in supplying AV solutions to the education and corporate sectors, display size does matter. This is particularly true in the education sector, specifically within the classroom setting. The main reason for understanding the importance of Display size is because if you want students to clearly read text on the main display, FONT size is important. As a summary, display size more importantly has to do with height of an image (LCD or projected), which directly correlates to the height of fonts. This is of particular importance in an education setting, where students can be sitting as far away as 6m from the display. As you lower the size of a display (height), this can produce readability issues, which could present a huge problem in the learning process. This potential issue is increased by the current types of content being used on the main display, which are often created on desktop/laptop devices. No longer is it just Powerpoint presentations, but collaborative learning such as using content from websites or Google documents. To help understand, we’ll take a 100 inch, 4:3 ratio display as a reference point, which was the standard display for many AV systems in classroom approx 10 years ago. These AV systems gave a display height of 1.5m. Many schools of recent times have been considering NEW LED TVs as their main display in classrooms (with a 16:9 ratio). Many of these are under 70 inch, typically 60 inch in size. With this size LED TV, the height of the display is 0.74m. This is less than HALF the height of the 100 inch display! Another way to explain screen size importance is by looking at differences in FONT sizes. If you displayed the same text at 10 font and 20 font on the same screen, representing the 60 inch TV and the 100 inch displays. Then gradually walk backwards. It wouldn’t be too long before you can’t read the size 10 font. It’s this dedication to educating clients on these types of aspects of an AV installation that make DIB Audio Visual a class leader in the AV industry. What is a DisplayPort connector? DisplayPort is a digital display interface. By using a Display Port connector (or cable) you can connect a video source to a display device, such as a TV or computer monitor. DisplayPort can also be used to carry audio and USB data. An important point to note is that while Display Port and HDMI connectors look similar, they are different and not interchangeable. DisplayPort connectors have 20 pins and are available in two sizes: DisplayPort and Mini DisplayPort (the latter is the port of choice for Microsoft’s Surface Pro tablet). Whilst Display Port supports Full-HD resolution (1920×1080), it does not appear on as many devices as HDMI, hence the reason not as many people know about it. How to choose a whiteboard size for classrooms? This FAQ is to help assist you in choosing the correct whiteboard size, when also using it as a projection surface. 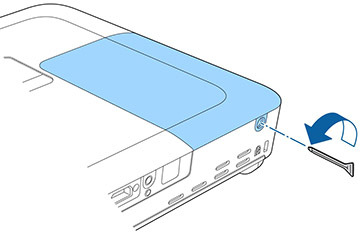 The following types of projectors are classic examples; Short Throw (typically 0.8 – 1.3m from the board) or Ultra Short Throw projector (typically from 0.8m – 0.6m from the board). When considering this topic, it’s important to ask; what subject is being taught in the space? For example, a Mathematics teacher generally likes to have lots of room to write on the whiteboard (typically 2.4m – 3m in size), whereas other subjects may not require as much room for writing. Commonly across schools, whiteboards are 1.2m high. This would allow you to project an 86 inch image, in a 16:10 format (widescreen). With many Ultra-Short Throw projectors enabling images to reach close to 100 inches in size, a larger whiteboard would need to be considered for these projectors. For example a 96 inch image in 16:10 format, would require a minimum whiteboard height of 1.4m. 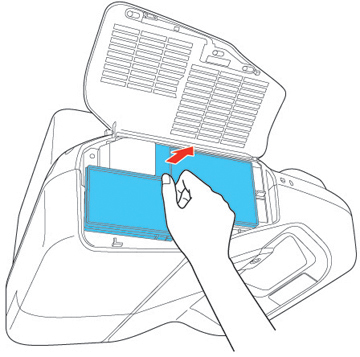 This is to accommodate the finger touch module in the Interactive Projectors, such as the Epson Epson EB-595wi or EB-1430Wi. For best touch results for the laser curtain (inside the module), they should be mounted on the whiteboard itself. This will produce maximum touch connectivity and reduces tracking issues across the surface of the whiteboard. Mounting of whiteboards is typically 900mm above the floor. This will give good access to the top sections of the projected image on the whiteboard and represents a good working height. If you take theses factors into consideration, you will end up with a much better result for your classroom. The examples given here should be used as a guide only. Why is whiteboard flatness is so important with Ultra Short Throw projectors? Before putting in a new projector, it is important to firstly assess your existing whiteboard. The question is – Is it really flat? This can easily be checking by putting your head against the whiteboard and looking down the length of the board to see if there are any gentle waves or distortions you can see. For traditional use of a whiteboard, these imperfections would be of little concern. But, as this FAQ section is about using a whiteboard with an Ultra Short Throw projector (which projects the image from an extreme down-angle), this can present significant issues on a slightly warped or wavy board. These slight defects or distortions in the board can cause a bend of the image. This is evident in the image not being square or symmetrical and sometimes having waves going through the image. As DIB provide high-quality AV installations and service, this whiteboard flatness is of high importance when installing an Ultra Short Throw projector. As such, we recommend specific types of whiteboards that represent a high integrity for flatness. These types of whiteboards include surfaces that have an porcelain or ceramic (vitreous enamel) finish, which is stuck onto a plaster substrate (the backing behind the whiteboard surface is of a thick plaster material). This type of construction helps produce solid flat whiteboards. This can be the difference between an economic AV install resulting in a less-than-desirable image and an excellent image, from a high-quality, long-lasting AV installation. What is a XLR connector? An XLR connector is a popular audio connector featuring 3-7 pins. The most common style is the 3 pin pattern, with two for sending signals and the third works as an overall system grounding (or earth). The primary application for XLR connections is to carry audio signals to interconnected powered speakers, commonly used in a PA system. A key feature of the XLR connector is the locking mechanism that “clicks” the connector into place and helps reduce the risk of cables disconnecting. You can have either a Male and Female end to an XLR connector. 5-Pin – Commonly used in digital lighting control, namely DMX512. Also used with stereo microphones. 6-Pin – Dual-channel intercom systems and applications for stage lighting control. 7-Pin – Remote control of several models of fog machines, including Le Maitre & Ultratec. Also used to connect some value condenser mics to their power supply. What is a 3.5mm connector? A 3.5mm connector has been typically used in AV systems to provide the Audio component for a VGA connection. This is also why there is no audio if either end of the cable is not connected to your laptop/device or AV system input plate. Other commonly used applications for the 3.5mm connector are headphones for mp3 players, such as an iPod. A more recent application for the 3.5mm connector is for Audio-Only playback in an AV system. This is a popular option, as it allows for audio playback without the need to turn on the whole AV system. Plugging one end of the 3.5mm connector to the input plate and the other to your device, you can now play music or audios using the speakers in the space. How can I effectively compare AV system quotes? Sometimes comparing AV quotes is like comparing apples and oranges! So you have 10 classrooms ready for an AV upgrade? Maybe you’re putting in an AV system for the new boardroom? >> The question really is… How can you make sure you’re comparing the same thing? To make things easier, DIB Audio Visual have designed an easy-to-use Quote Checklist to assist you in comparing AV quotes. You don’t want to get a lemon (or an orange), if you were looking for an apple! Mirrorcast is a wireless display standard that does away for the need for a HDMI cable connection. It’s main purpose is to allow wireless mirroring of content from a portable device, such as a smartphone, tablet or laptop. It is designed to work across multiple-platforms, unlike many other offerings on the market. A main benefit of Mirrorcast over other wireless technologies is that it doesn’t impact on your school or business network. This is because the devices make a direct WiFi connection; no routing involved. With this configuration, this also creates a security feature in corporate environments, where visitors can connect and share without using the main network. This can also be applied to boardrooms or meeting rooms within school settings. Alternatives to Mirrorcast include Apple Airplay, Google Chromecast, Intel WiDi and DLNA. These have other benefits or limitations in comparison to Mirrorcast. > Miracast can securely transmit video up to 1080p with 5.1 channel sound. An interactive whiteboard is a display that allows you to interact with the projected image, using content connected from a laptop, PC or portable device. This projection is normally onto a whiteboard surface, hence the name “interactive whiteboard”. Once connected (via USB), the content from the device is then projected onto the whiteboard surface, where special pens or your finger can work as a mouse (like a big, touch-enabled desktop computer). This unique technology allows you to manipulate the content on the whiteboard, including website navigation, interactive educational programs or editing displayed content. Many newer models feature wirelessly display capabilities, with the ability to display content from other devices for a truly collaborative classroom / workshop / meeting. Companies that manufacture IWB products including Epson, Hitachi, NEC, Sony, Benq and many more. In a similar comparison to cars, all projectors are not created equal. Projectors are differently designed and this can contribute to many things including performance, sharpness and maintenance. It is important to do your research about projectors and talk to an AV industry expert to determine differences if you are at all unsure. As a reference point, many agree that Epson are a leader in the field of projector technology. Two excellent examples of are the Epson EB-595Wi and Epson EB-1430Wi interactive projectors. To find out how an IWB differs from a Touch Screen, please click here. What is an Interactive Touchscreen? An interactive touch screen is an LED or LCD panel with a touch enabled screen. This unique aspect of the screen allows you to interact or touch, manipulating the content displayed. This is typically from a laptop or from digital signage technology. Generally this technology uses a combination of sensors and cameras either at the edge of the screen or as an overlay, to enable touch functionality. 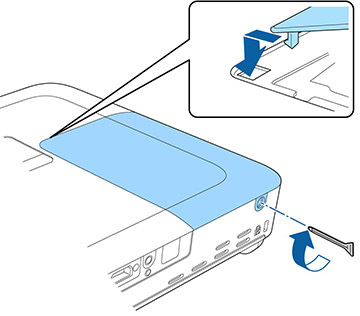 This detects the proximity of the finger/pen and engages the desired function in the specific area of the screen. These interactive touch screens come in sizes ranging from 55” up to 85 inches. Features of an Interactive touch screen include a pen or finger-touch enabled screen, giving an accurate touch experience. Along with this are interactive, collaborative opportunities for learning or presentations, with others able to contribute either on the screen or via a wireless-enabled device. Brands in of Interactive Touch Screens include Hitachi, Philips, CommBox, Samsung amongst others. To find out more about Interactive Whiteboards (IWB), CLICK HERE. What is the difference between an interactive whiteboard (IWB) and an interactive touchscreen? Both are interactive technology and provide a touch interface as your main display. Generally connection to the display is via HDMI or VGA, using a portable device, such as a laptop, tablet or a PC. From Full-HD to 4K the pixel count doubles and then it doubles again from 4K to 8K. To get a better understand of this, have a look at the picture below. > 4K UHD resolution is 3840 x 2160. > 8K UHD is even higher, at 7,680 x 4,320. Not only is there more pixels, but the dynamic range of highlights and shadows are further enhanced in UHD over Full-HD. To better understand the jargon of screen sizes, display sizes are commonly referenced by their height (1080p (Full HD), 2160 (4K), 4320 (8K). 4K is the new frontier, with more and more content being made available everyday. There are even a number of affordable options for recording devices, including many DSLRs cameras and video cameras in the consumer market. Even the new iPhone 6 mobile phones are capable of recording 4K content. With 8K video recording devices costing up to $20,000, content at this level is the next medium that will become the eventually become the norm, but this may be a little while off yet before is becomes at a consumer level. There is not a lot of content available at present. This, like a most new technology, this is mainly due to the prohibitive factor of cost. What is echo cancellation and how does it relate to AV? Echo cancellation is a means of eliminating echo from an audio path. For example, echo may occur in a video conferencing or audio conferencing situation. The technology works by first detecting the original transmitted signal that reappears (with some delay) in either the the transmitted or received signal. Once this echo is recognised, it can then be removed from the transmitted or received signal, thus eliminating the echo that was there. This is why echo cancellation technology is of particular importance with Video / Audio Conferencing. The diagram below illustrates how sound waves are reflected and create an echo. This is the signal that a microphone would pick up and re-broadcast in a Video / Audio Conferencing situation. The echo cancellation technology recognises the same signal has appeared twice and removes it before it is rebroadcast. Some of the video conferencing (VC) technology brands within the AV industry include Vaddio and Polycom. Both of these brands produce high quality simple solutions for video conferencing, with echo cancellation technology built in. There are many offerings in the marketplace, however, Vaddio and Polycom have high quality, straightforward systems that we know are generally of a high standard. In most instances, audio, not video, is the vital part of a video conference and where communication can break down. Having high quality echo-cancellation technology built into your video conferencing AV system can help eliminate this and give you a pleasant video conferencing experience. So your school experienced a power blackout or surge. Your projector which was working beautifully is now asking for a password when it turns on. What do I do? It’s a simple solution to reset your projector and get it up and running again. This will reset your projector and you are now up and running. Voila! Problem: The EPSON projector is displaying an orange screen. Solution: This occurs in EPSON education projectors when the input isn’t connected properly. If this happens, simply ensure that the cable is properly plugged into both the wall plate and the laptop/computer. As soon as you connect this cable properly and choose the right source on the control panel this error page will dissapear. Problem: The projector keeps turning off. Solution: First, check the projector’s filter for dust build-up. 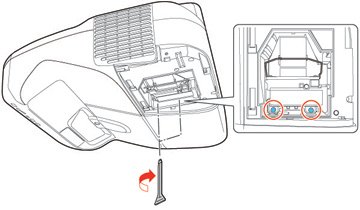 If the projector is still turning off, it is likely that the internal fan or ballast may be at fault. This can be a result of not servicing your projector regularly. If this is the case contact the DIB service staff as the projector needs to be repaired. Problem: Colours are missing or not displaying properly on the screen. Solution: This issue might happen when using a VGA input. It can be solved by making sure that the VGA cable is fitted firmly and completely in the wall plate and laptop. Otherwise, it might be that the pins in the VGA cable are damaged or out of place. This can be fixed by using a new or different VGA cable. Remember to look after your projector and regularly service it so that it can run optimally. Some people have had issues with the Epson ELP-DC06 Document Camera/Visualiser when using the latest Windows and Mac operating systems, Windows 10 and IOS El Capitan respectively. Thankfully these issues can be quickly fixed by installing certain imaging software. If you are having this issue, please contact our service team (service@dibaustralia.com.au) and they will walk you through the software fix. With this issue, the projector will display a normal image when using HDMI input but then get a reddish image on the VGA input (see below for an example of how this looks). This is a case that some of our clients have encountered and is the result of the projector being fiddled with and a setting being accidentally changed. 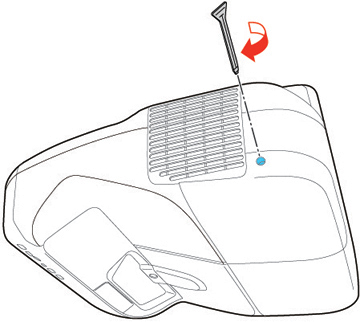 5.Press return and exit the menu. How do I setup a wireless microphone? Please see the short video below for an easy walkthrough of setting up and syncing a wireless microphone. Some customers have been coming to us with a issue characterised by sound cutting in and out on their wireless microphone systems. Commonly, if you are experiencing such a thing, the problematic system is running in an old unauthorised frequency band and you need to replace the microphone. Faulty cables can see a number of symptoms in your projector, monitor, or other display. If you’re noticing mixed colour or missing colour images when using a VGA connection, your VGA cable may be faulty. On the other hand, a common sign of a faulty HDMI cable is the image cutting in and out. These issues can be avoided altogether by using higher quality AV cables. At DIB Australia, we supply high grade premium VGA & HDMI cables at a competitive price with 7 years warranty. For more information about VGA ad HDMI cables, or any service further questions, please contact our dedicated service team (service@dibaustralia.com.au). The Australian government changed the legal frequency band for wireless microphone receivers on 31/12/2014. If you’re still using the old frequency, it causes issues like sound cutting in and out. The good news is that with Mipro receivers you can quickly check if you are on a right frequency band with the instructions below. If not, you need to replace the wireless receiver and mics. Checking the frequency band of your Mipro receiver: If you own a Mipro system, then you can identify the operating frequency band by the sticker displayed on your wireless microphone receiver. If your system operates on the 7D band, or you have a different system operating between 694-820MHz, then your wireless microphone system will need replacing. Click Here for more information about this frequency change. Does your space need hearing augmentation? Changes to the BCA (Building Code of Australia) ad the DDA (Disability Discrimination act) mean hearing augmentation services need to be provided when an inbuilt amplification system is installed in certain situations. Also known as an Induction or Audio loop, provides a wireless signal that can be picked up by a hearing aid when set to the Telecoil setting. The hearing aid picks up this signal and converts it into sound instead of using the hearing aid’s built in microphone and amplifier. This provides improved speech understanding as the signal has no background noise. Infrared systems broadcast sound over infrared light that is converted back to audio by infrared receivers. Similar to the hearing loop, infrared systems only pick up the audio broadcast by the designated microphone and do not pick up as much background noise. Audio can be broadcast via FM radio over a small area. Hearing aids can then pick this audio up directly by tuning to the corresponding frequency. Where are hearing augmentation systems required? There are additional factors for selecting a hearing augmentation system outside of the BCA that need to be considered. These include sound reverberation, background noise, sound source distances and shapes of rooms. The BCA does not make 100% coverage a requirement as it is possible for systems to spill over into other rooms and interfere with the augmented hearing systems in other rooms. 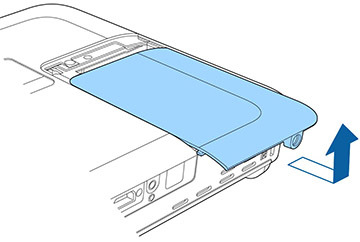 Induction loops can spill 10 metres over the area they are designed to cover. Infrared systems only work in direct line of sight, meaning there is less spill over but performance drops in large or oddly shaped spaces. FM transmitters cover large areas, but can be controlled with multiple frequencies. For more details on how DIB Australia can help install your hearing augmentation system, or assistance with your custom audio visual requirements please phone DIB on (03) 9457-4800 or contact us today. The Epson PowerLite 1780w is a compact, portable projector that can be carried around with you and taken from meeting to meeting. It’s a tough little unit that can take the bumps and tumbles that come with being carried around in a bag. Despite its rugged design, its still a projector you want to look after to make sure you get the most out of. The last thing you want is it over heating after being taken out of your bag or for the picture quality to drop. How should I transport the projector? Keep the lens covered in transport with the lens protector. Use the case when transporting the projector, even by hand. The projector will notify you when the filter needs cleaning. However, you should clean the filter whenever you notice a build up of dust inside the projector. Note: You can remove the air filter so you can clean both sides of it. Do not rinse the air filter in water, or use any detergent or solvent to clean it. Do not use canned air. The gases may leave a flammable residue or push dust and debris into the projector’s optics or other sensitive areas. Replace the air filter when it becomes full of dust that can’t be removed or when it gets damaged. After cleaning the air filter, you still see a message saying the air filter needs to be cleaned or replaced. 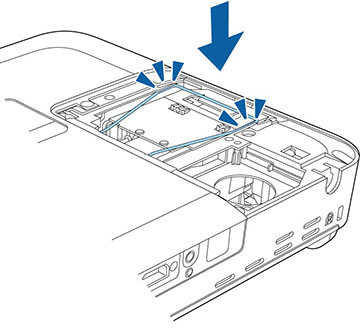 You can replace the air filter while the projector is mounted to the ceiling, if necessary. 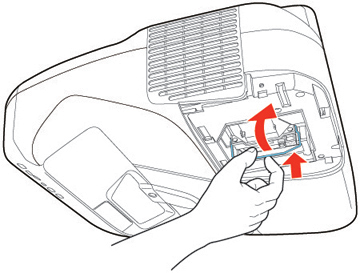 Grasp the tab at the center of the air filter and pull it out of the projector. Note: Air filters contain polycarbonate, ABS resin, and polyurethane foam. Dispose of used air filters according to local regulations. Clean the projector’s lens periodically to remove dust and smudges on the surface. Gently wipe the lens with lens-cleaning paper. To remove stubborn smudges, moisten a soft, lint-free cloth with lens cleaner and gently wipe the lens. Do not spray any liquid directly on the lens.Warning: Do not use a lens cleaner that contains flammable gas. The high heat generated by the projector lamp may cause a fire. Caution: Do not use glass cleaner or any harsh materials to clean the lens. Do not subject the lens to any impacts; you may damage it. Do not use canned air, or the gases may leave a residue. Avoid touching the lens with your bare hands to prevent fingerprints on or damage to the lens surface. Warning: If the lamp is broken, glass fragments may be loose inside the lamp chamber. Be careful removing any broken glass to avoid injury. Lift up the metal bar securing the lamp. Lift up the lamp handle and gently pull the lamp out of the projector. Caution: Lift the lamp handle carefully to avoid damaging the handle as you pull out the lamp. Note: The lamp contains mercury. Please consult your state and local regulations regarding disposal or recycling. Do not put in the trash. Gently insert the new lamp into the projector. If it does not fit easily, make sure it is facing the right way. Press down on the area shown to secure the lamp in place. Press the metal bar down over the lamp until it clicks into place on both sides. 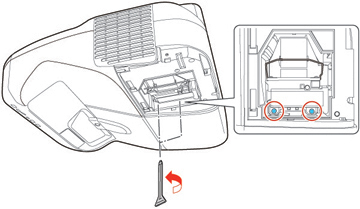 You must reset the lamp timer after replacing the projector’s lamp. 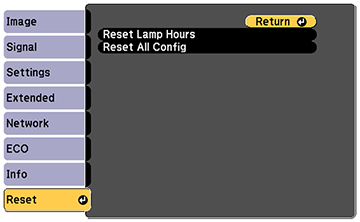 Resetting the timer clears the lamp replacement message and helps keep track of lamp usage correctly. To remove stubborn dirt, use a soft cloth moistened with water and mild soap. Do not spray liquid directly on the projector.Caution: Do not use wax, alcohol, benzine, paint thinner, or other chemicals to clean the projector case. These can damage the case. Do not use canned air, or the gases may leave a residue. Replacing a lamp is part of the ongoing maintenance required when using a projector. Many projectors make this easy to do, and can be done with the projector still mounted on whatever surface it is fixed to. Note: This guide is based on the Epson Brightlink 475wi, but can be used as a general guide on how to replace a projector lamp. If you have any complications replacing a projector lamp, contact the manufacturer or the installer. You can replace the lamp while the projector is mounted on the wall or ceiling. 1.Turn off the projector and unplug the power cord. 2. Allow the projector lamp to cool down for at least one hour. Warning: If the lamp is broken, glass fragments may be loose inside the lamp chamber. Be careful removing any broken glass to avoid injury. If the projector is mounted on the wall or ceiling, stand to the side in case the lamp is broken. 3. 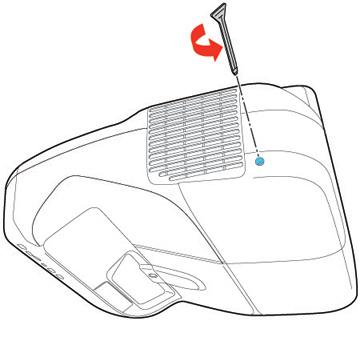 Use the screwdriver included with the replacement lamp to loosen the screw securing the lamp cover. 4. Slide off the lamp cover. 5. Loosen the screws securing the lamp to the projector. The screws do not come all the way out. 6. Lift up the lamp handle and gently pull the lamp out of the projector. 7. Gently insert the new lamp into the projector along the guide rail. If it does not fit easily, make sure it is facing the right way. Press the handle down. Caution: Do not touch any glass on the lamp assembly to avoid premature lamp failure. 8. Tighten the screws to secure the lamp. 9. Replace the lamp cover and tighten the screw to secure it. 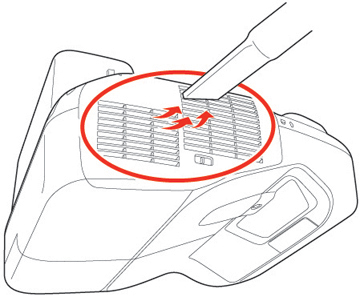 Over time, your projector will gather dust in its air filter and need to be cleaned. Projectors have notifications telling you when an air filter needs to e cleaned, but you should make cleaning the air filter part of your regular process to maintain a projector. Here are the steps to take when your projector says it’s time to clean the air filter, or of you want to clean the air filter yourself as part of ongoing maintenance. 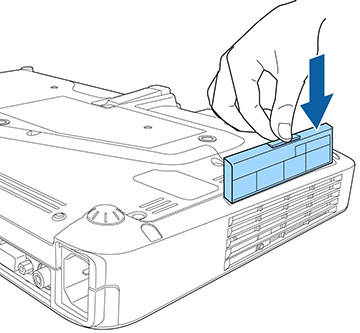 Note: This guide is based on the Epson Brightlink 475wi, but can be used as a general guide on how to replace a projector air filter. If you have any complications replacing an air filter, contact the manufacturer or the installer. Do not use canned air, or the gases may leave a residue. 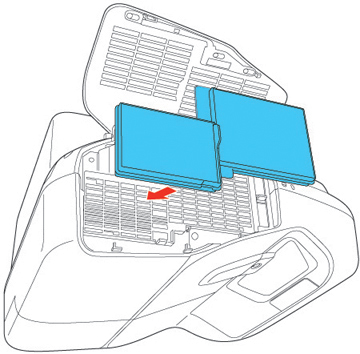 If dust is difficult to remove or the air filter is damaged, replace the air filter. Air filters will only last so long before they need to be replaced. Even with regular cleaning, it is impossible to remove all the dust from an air filter, and dust will build up over time. You should replace an air filter when it is damaged, or when the projector says you need to clean the air filter, even when you’e just cleaned it. 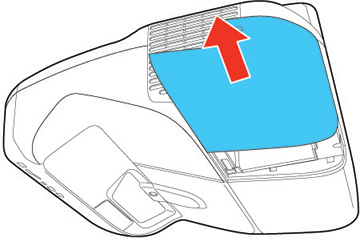 You can replace the air filter while the projector is mounted on the wall or ceiling. 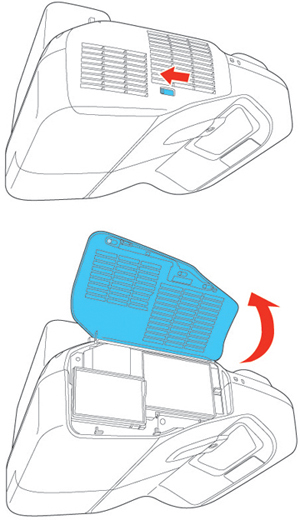 Slide the air filter cover switch and open the air filter cover. Place the new air filter in the projector as shown. Can I stream video with iProjection? No. Videos and Flash are not supported. The app will only display photos and documents. How do I put documents into iProjection’s Document option? Select your iOS device in iTunes. Scroll to the File Sharing section of the Apps window. Select iProjection, then Add. Navigate to the file you’d like to place in Documents, select the file, then click Open. The file will now be in the Documents option. 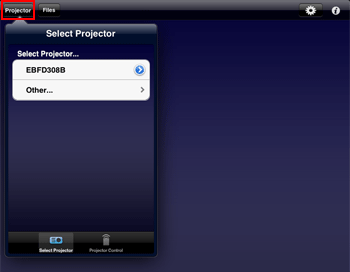 How do I set up EPSON iProjection with my iOS device? I don’t have the optional wireless module for my product, can I still use iProjection? Connect your projector with a RJ45 connection to your network. Connect your iOS device with a wireless connection to the same network your projector is connected to. On your iOS device, tap iProjection, then tap projector. Which devices are compatible with iProjection? Apple iPad, iPad2, iPhone, iPhone 3GS, iPhone 4, iPhone 4S, iPod, iPod Touch (3rd Generation). How do I display a Keynote file with iProjection? If your Keynote file is already on your iOS device, go to step 10. Save your Keynote file to your Mac or PC’s Desktop. Scroll to the File Sharing section of the Apps screen. Select iProjection, then Add. Navigate to the Keynote file, select the file, then click Open. The file will now be in iProjection’s Document option. Select to eject your iOS device from iTunes. Tap the Projector button to open the Select Projector menu. Note: If your product doesn’t appear in the list, tap Other. Enter your projector’s IP address in the IP Address field. If you don’t know the IP address, you can find this information in the Network section of the projector’s menu or by pressing the LAN button on your projector’s remote control. See your projector documentation for more information. Note: If you’re using an iPad, tap Files and then tap Documents. The presentation should now display on your projector. Which file types can I display with iProjection? My iOS device is not connected to the internet after I connect it to my product with iProjection. Why? If your iOS device is connected to the projector via a direct wireless connection (also known as an Adhoc connection), your iOS device is no longer communicating with your network (for internet access). Select Advanced as the Communication Mode on the projector. Enter the SSID (network name) into the projector using its menu system. If your router assigns IP addresses, select IP Settings and set DHCP to On. If your network is set up with security, select Security and enter the security type, PSK or encryption key of your network. Save the settings and exit the menus. Select LAN on the projector’s remote. Connect your iOS device to your Wi-Fi network. Use iProjection to connect to your projector. Can I use the iProjection app to display a file attached to an email?
. See your projector’s documentation for instructions. Open your e-mail in your iOS device. Open the attached file (.pdf, .ppt, .xls, or .doc files are supported). Tap the top of your image or document, select Open In, then select iProjection. Connect to your projector when you see the prompt to do so. When I’m connected via Adhoc or Quick connect using my iOS device and I select Web Page, I see the message The Internet connection appears to be offline. What should I do? Lamp vs. Laser projection, what’s the difference? Not sure which light source is right for you? Compare the benefits and considerations associated with lamp and laser projectors to inform your purchase decision. Almost every teacher has had to deal with the problems that come with your standard bulb projectors. They blow in the middle of a lesson, require maintenance over time, and can lose quality as the bulb ages. There’s a new type of projector in town, the laser projector. This new type of projector uses an LED-based laser light to project its images. But are laser projectors the new be all to end all of projectors? Lamp projectors are the traditional projectors you know (and love?). Lamp projectors use a giant light bulb to project their images on the screen. 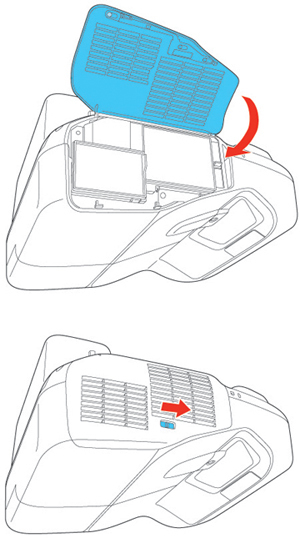 The lamp takes time to warm up, loses image brightness after 10 hours, and requires fans inside the projector to deal with all the heat generated. However, lamp projectors are cheaper and easier to setup in the initial stages. Since lamp projector technology has been around for a number of years, they have become relatively cheap and easy to maintain. Laser projectors use LED lights to project their image. LED’s are brighter, have a sharper image, require no heating up, and use less electricity. Running at a lower temperature means laser projectors don’t require as much cooling inside the projector unit. Laser projectors also have greater contrast than lamp projectors. Blacks on laser projectors are much stronger as the LEDs just don’t fire on black sections of the screen. Lamp projectors need to project no matter what, meaning blacks are never as dark as they could be. Laser projectors also last longer than lamps. The unit in most laser projectors can last for 20,000 hours, meaning they could be run for 8 hours a day for 12.5 years without maintenance. Laser projectors do cost more. The laser projection units cost more as well due to the newer technology. However, when you balance the figures, the electricity and maintenance savings of a laser projector over its lifetime compared to a lamp projector makes the benefits obvious. The only drawback to laser projectors is price, which is dropping all the time. There are too many benefits to laser projectors to pass them up if you can afford it. If you have the budget for laser projectors, you should consider them in your next AV upgrade. Try these solutions when you cannot monitor or control the projectors. Make sure the projector is turned on and connected to the network correctly. Set the Standby Mode setting to Communication On in the projector’s menu so the network software can monitor the projector in standby mode. Make sure the projector you want to monitor or control is registered to Epson Projector Management. Turn off the DHCP settings for your projector. If you turn on the DHCP settings, the projector’s IP address changes automatically and Epson Projector Management may not be able to search for the registered projector. When you restore settings from the backup file, extract the zip file and copy the extracted files to the following directory. Make sure your electrical outlet or power source is functioning correctly. Select Test Email on the Mail tab of the Environment setup screen. If you do not receive the test email, check all of the settings on the Mail tab for accuracy. In your firewall settings, open the UDP port to allow Message Broadcasting to communicate through the required port. See your firewall software documentation for instructions. When you press the [Esc] button on the projector’s control panel or remote control to discontinue message broadcasting, the message broadasting feature is disabled. To distribute messages again, restart the projector.